› A Year After "Occupy Wall Street"
In a society where the pitching of a tent in urban parks is sufficiently radical to qualify as occupation, meaningful and fundamental change has become impossible. An occupation is no triviality: an occupier moves into foreign territory, seizes power, and controls the freedom of movement of the inhabitants of the occupied country. Occupying a country that is uninhabited and whose territory isn’t used for any other organized purpose is thus a curious undertaking. Of course, occupation might be preventive and motivated by the expectation that someone will soon seek to inhabit or use the land, and that the occupier will merely preempt occupation by a different power. Once the land is occupied, nobody else can easily seize it. Occupation is a necessary component of revolutionary change. The revolutionary has to prevent people from continuing in their established ways, he or she must disturb their everyday habits and aspirations, and he or she must step into their path. Barricades aren’t usually erected to provide cover to their defenders and obstruct those who want to pass them. They are a visible reminder of the disruption of everyday life. One occupies busy pathways to prevent people from reaching their ordinary destinations. Generally, those who seek to pursue business as usual have the law on their side: after all, we institute laws precisely to regulate and enable the everyday functioning of society. Those who occupy and erect barricades challenge existing laws almost by default. This does not upset the occupier: after all, his actions aim at changing society and society’s norms and customs. 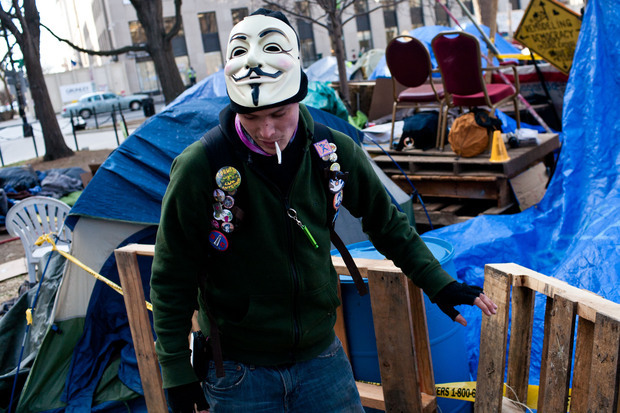 When the Occupy Movement began a year ago in the United States, a certain absurdity was present from the beginning. The “ridiculousness” of the movement that has been criticized by politicians did not stem from the movement’s aims but from the presumptuousness of the term “occupy” itself (a term which was originally intended as a call to action). From day one it was evident that the movement came from the internet: from a space where it’s easy to avoid one’s opponents, where activists can build their own networks that barely overlap with the networks of those who hold different opinions and pursue different aims. The internet is the space for parallel media realities where anyone can feel powerful and must not fear an encounter with those he seeks to fight. When a movement that is rooted in the internet pushes into the physical world, parallel realities continue. Activists seized a park in midtown Manhattan, not far from the stock exchange, but far enough away to reduce physical contact with the world of high finance and its security forces to a minimum. The pompous name “Occupy Wall Street” speaks to the pretensions of the activists: Wall Street was never occupied. The tents were erected on a patch of land that was only used by passerby for leisurely Sunday walks. In the months following, the movement swept across the Western world. Even in small-town Germany, a few tents were pitched next to office complexes. No financial investor was prevented from doing his business, governments – regardless of whether their policy choices were good or bad – could easily ignore those who called themselves “activists.” They weren’t real occupiers but merely an inconvenience, like construction sites or poorly parked cars. Today, in true bureaucratic fashion, we witness debates about the proper placement of park benches and tents, and enraged citizens complain on the comment pages of local newspapers about the sorry state of the parks that surround Occupy camp sites. We don’t have to share the goals of anti-nuclear activists, but we should at least concede that the truly passionate among them physically obstruct their opponents (even if their enthusiasm quickly dwindles when uniformed officers carry them away). By comparison, those who have gathered under the big banner of “Occupation” are merely a farce, a caricature of the fight for barricades. They ridicule the heroic aspects of revolutions that truly began with occupation. In a society where the pitching of a tent in urban parks is sufficiently radical to qualify as occupation, meaningful and fundamental change has probably become impossible. What’s left? A gradual slide into agony.